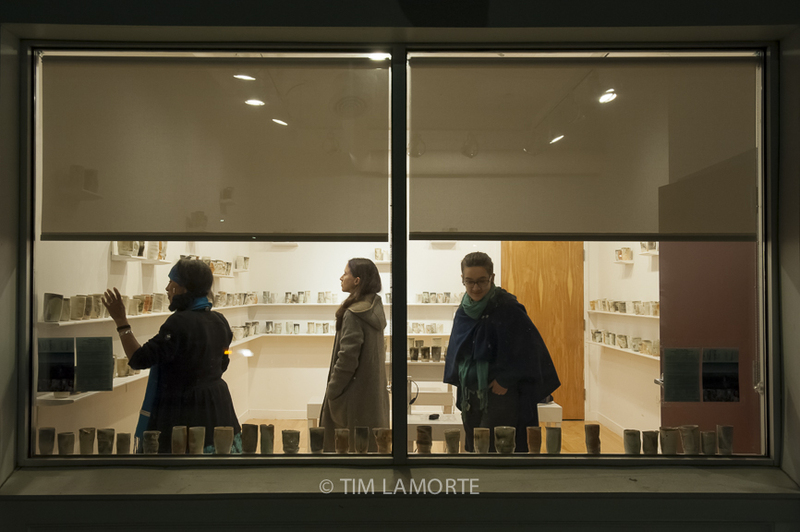 POUGHKEEPSIE, NY — Three hundred and sixty five porcelain cups line the walls of the Art Centro Gallery on Main Street. Elizabeth Phelps Meyer, who made them, filled 328 with water from the Cannonball and Missouri rivers, which form the northern and eastern borders of the Standing Rock Reservation, where Native Americans and their allies protested the construction of the Dakota Access Pipeline for 328 days between 2016-17. Titled “Each Day, Water,” the exhibition opened on Oct. 2, two and a half years after the first water protector camp was established at Standing Rock. The exhibition closes Oct. 27, two years after police raided the camps. For the closing, participants will carry the cups from the gallery to the Hudson for a ceremony led by a water protector from Standing Rock. Meyer teaches art at the Oakwood Friends School in Poughkeepsie. Though she was not at Standing Rock during the standoff, that event influenced the way she molded the cups then fired them in wood kilns. Each cup is one of a kind. “I wanted them to be beautiful, but I also wanted them to reflect the violence that was happening,” she said. Meyer collected the water for the cups this past summer. She also recorded interviews with 25 water protectors, which visitors can listen to at the gallery. Native American singer and storyteller Joan Henry performs at Art Centro.